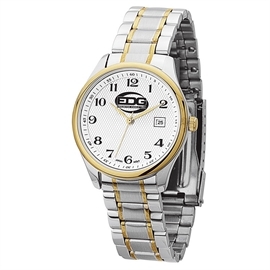 Solid brass case, two tone gold and silver finishing, high precision Japanese 3 hand movement, date display, mineral crystal, folded steel two tone bracelet, water resistant to 3 ATM. Size: 1 " x 1.38 " x 1.38 "
Price Includes:Up to 3 color/1 location. Set-ups apply.